Sanrio, the Japanese company which owns the imaging rights of the most famous kitten in the world, Hello Kitty, has signed a licensing contract with clothing giant Inditex. Resulting from this agreement will be Hello Kitty collections by Zara. At the end of April the little Kitty’s face, which was launched in Japan more than 30 years ago, will not only make its debut at Zara’s ready-to-wear clothing stores, but also on objects for Zara Home. 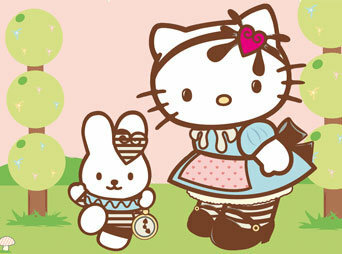 Sales of Hello Kitty products, which decorate around 50,000 items in sixty countries across the world, represent half of Sanrio’s annual turnover. Hello Kitty has launched a skincare line, in collaboration with beauty brand The Creme Shop. Puma is strengthening its ties with the luxury fashion industry via a new collaboration with Karl Lagerfeld.